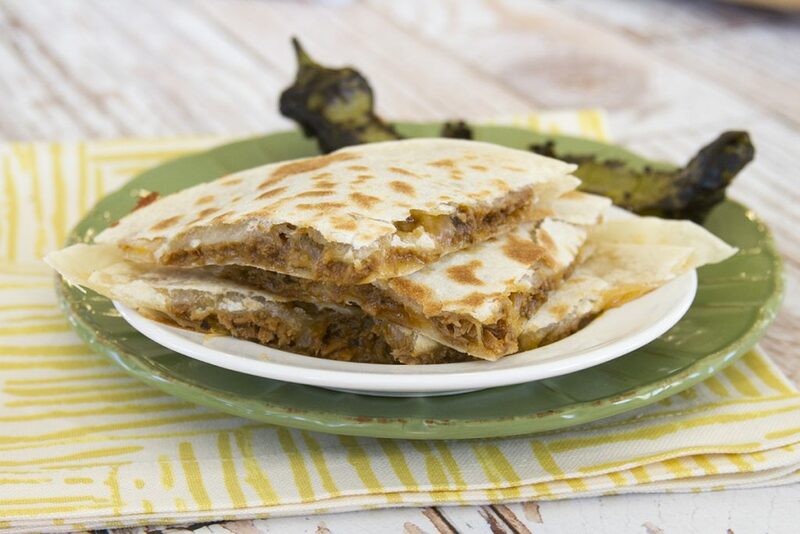 Quesadillas are the go-to quick weeknight meal around my house. Everyone loves them and they come together so quickly. 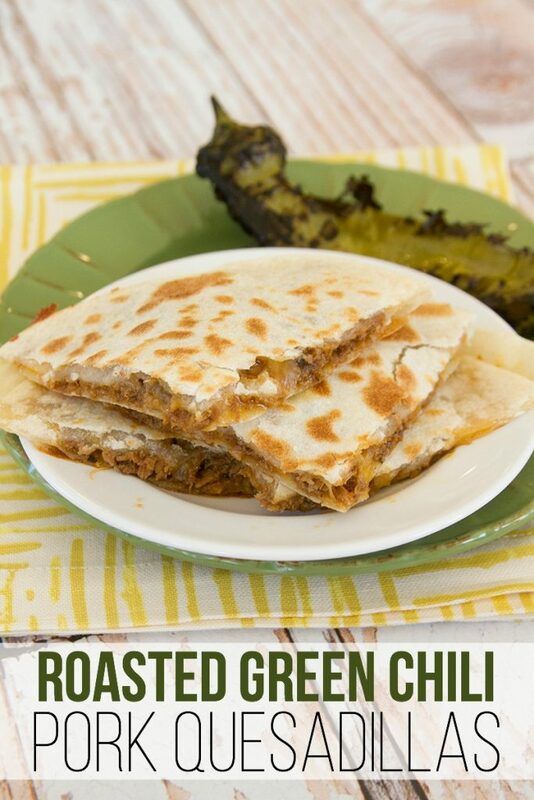 The Roasted Green Chili Pork Quesadillas always hit the spot. You can make the sweet green chili pork ahead of time so it is ready to go when you need it. This makes the perfect dinner and is a serious crowd-pleaser. I think it is safe to say that I could live off of quesadillas. They are quick, portable, and absolutely delicious. Pulled pork quesadillas are always my favorite. I love to make up a big batch of pulled pork and use it for lunches and dinners for several days. 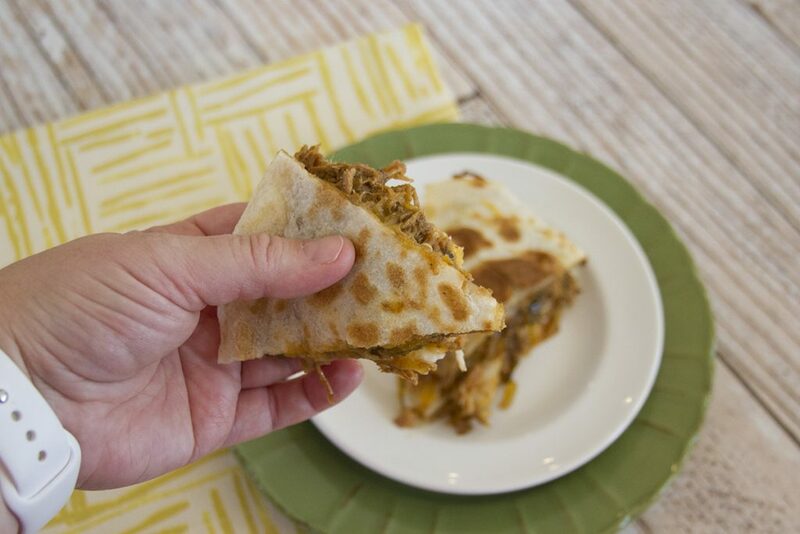 The pulled pork in this quesadilla is loaded with roasted green chilis and sweet onions. It is the perfect combination of spicy and sweet and it is one recipe that never gets old. I could easily eat this several times a week and never get bored with it. Sometimes we’ll change things up and throw this pulled pork on nachos, in a burrito, or on top of a baked sweet potato. It’s pretty versatile so it never goes to waste..
Quesadillas are also one of our favorite choices for backyard picnics and summer adventures. We’ve even thrown these on the grill to finish them up and it gives them an amazing smoky flavor. To make things really simple, you can wrap these in foil before putting them on the grill. That really simplifies clean-up. What really makes this recipe fantastic is we use great quality pork in it. Let’s face it, not all pork is created equal! I’m a huge fan of Smithfield® pork and the Smithfield Boneless Center Cut Loin is my favorite when I need to cook for a crowd. It’s even 20% more tender than the other leading brand for Natural Pork. We get ours at Lin’s Fresh Market but it is also available at Lee’s Marketplace. You can visit http://www.smithfield.com/meal-ideas/ to get even more recipe inspiration! 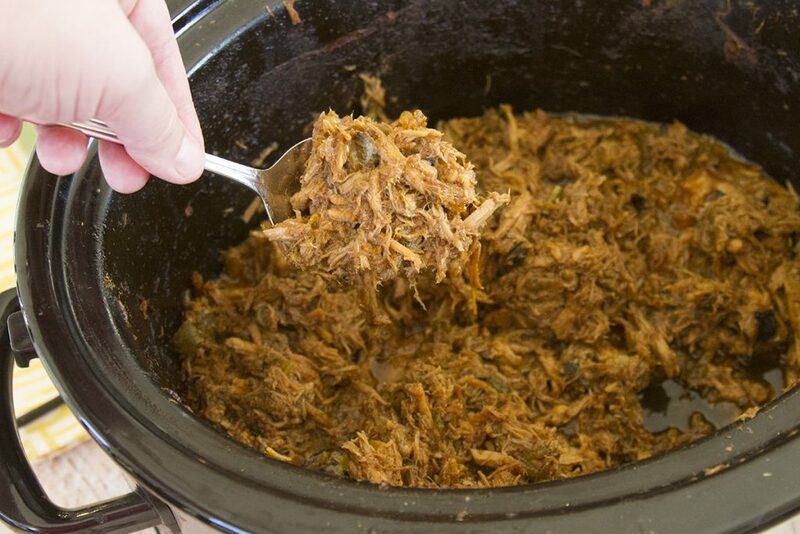 We throw this in the slow cooker to make up a big batch of green chili pulled pork. If it’s just our family enjoying it, we’ll freeze half of it for another meal later. 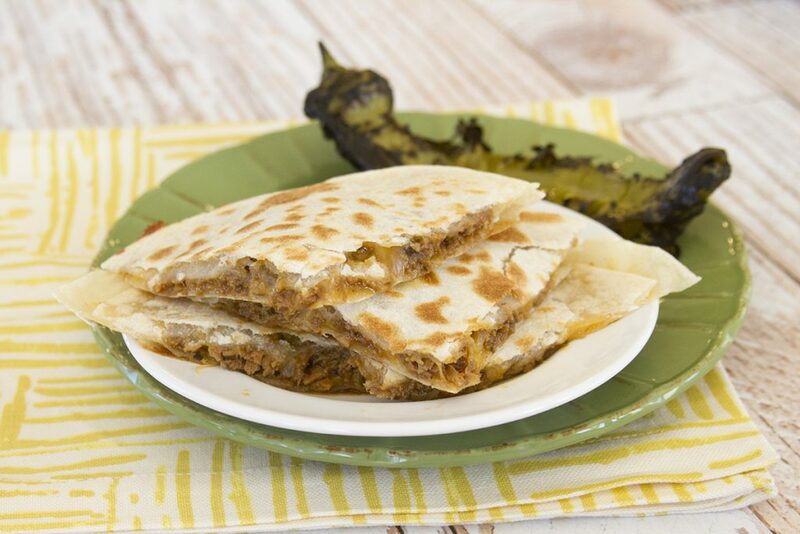 If we have guests over, we have a great time letting everyone create their own quesadillas. We lay out a table with quesadilla toppings and everyone always seems to enjoy it. Grilled peppers and onions are also FANTASTIC in these, but, I will warn you they can make your quesadilla a lot messier. I have the same problem with quesadillas that I do with salad bars: I like to load them up with as many things as I can, which sounds like a good idea until it is time to eat. My family always makes fun of me because my food is generally the messiest, but I don’t care. It always ends up tasting delicious. 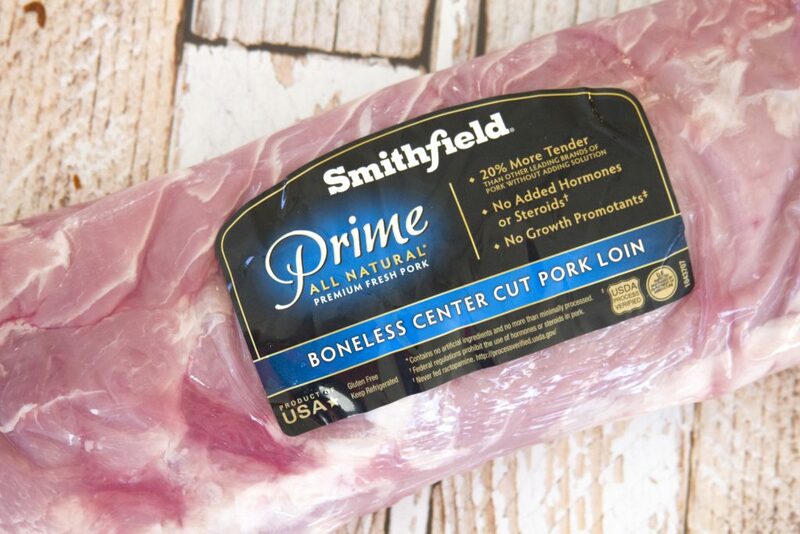 Place the Smithfield Prime Fresh Pork Boneless Center Cut Loin in your slow cooker. You can cut this into two large portions if you’d like to save part of it to cook another time or if it doesn’t fit in your slow cooker. Sprinkle with your favorite grill seasoning and cook on high for 4-6 hours, or until the pork is tender and can be pulled apart with a fork. Shred the pork then return it to the slow cooker. Combine the garlic powder, molasses, brown sugar, chili powder, black pepper, apple cider vinegar, diced green chilis, and diced onion. Stir into the shredded pork and cook on low for another hour. Once cooked, stir to combine all the flavors and juices. Spread a layer of meat and a layer of shredded cheese on a tortilla, top with another tortilla and cook 2-3 minutes on each side, until light brown. Slice and serve with your favorite quesadilla toppings.